As fast as summer approached, it is now over; and for myself, it marks the closing of an intense field season and the beginning of my first year as a graduate student. However, this does not mean that the experiments, laboratory work, and data collection is put on hold. There is still plenty of work to check off the “to do” list that seems to never get any shorter. My last post introduced the scientific question I was hoping to answer and the reason for studying the relationship between crown conchs and oysters in the Matanzas River as opposed to a different location. While I did not answer the question entirely (that would be far too difficult to accomplish in one summer), I was able to establish a strong, preliminary data set that I can now analyze and re-configure in order to improve upon this research next season. Similar to methods described in David and Tanya’s posts, the construction of my experiment consisted of (much smaller) trenches dug for cage installation, Z-spar for attaching oyster spat to tiles, bumblebee bee tagging kits for marking appropriately weighed and measured oyster clusters, and various amounts of PVC for expensive data logger equipment housing. The fun meter never stopped ticking this summer in St. Augustine! As I sit in my cubicle in my new office on campus, my mind cannot help but wander back to my life this summer driven by the time of low tide and whether I would have enough sunlight or energy to kayak out to one more site. To my surprise, the running of my experiment was manageable and actually became a relaxing routine. Data collection was divided into three categories: conch surveys, oyster health, and data logger maintenance. The number of conchs found on the experimental reefs was recorded in order to quantify the varying densities of these predators at each site. The health of the small oysters attached to tiles as well as the tagged larger clusters were assessed based on the number of live and dead. The data logging instruments record the water temperature, salinity and amount of tidal inundation occurring at each of my six experimental oyster reefs every five minutes (so there are a lot of data points to be analyzed here!) and require periodic scrubbing to remove algal and barnacle growth. While the daily workload may seem light as far as stress levels; the fine print of every step of an experiment can be a tremendous mix of emotions. The hope for not just data but “good” data is something that all scientists share; however, this does not mean that conducting research needs to be filled with anxiety. The outlook that I aimed to have this summer was more based on the feelings of excitement and opportunity rather than high expectations that may or may not be met. To be able to conduct this study in such an ecologically rich environment surrounded by intelligent, supportive, and proactive people and institutions is an accomplishment in itself. While my data set still requires endless hours of manipulation and analysis, the general outcome of my experiment this summer revealed that there is in fact an oyster health gradient occurring along the Matanzas River, with a change in health occurring around the Matanzas Inlet. In tandem with this increasing oyster mortality moving from my sites north of the inlet to the sites south; are high densities of crown conch populations on the southern reefs, with a decrease in these populations moving towards reefs north of the inlet. Furthermore, environmental factors (water temperature, salinity and tidal inundation data collected by my instruments) will be considered when looking at these patterns. As a way to better quantify the health and size of the oyster community as well as the density of the resident species (such as crabs, worms, and other amphipods) that inhabit oyster reefs; I surveyed and sampled background reefs at each of my six experimental sites. Long story short, this meant that I randomly selected four new oyster reefs at each site in which I collected environmental data and basic reef characteristics (type of reef, location, dimensions), conducted conch surveys, and collected every living oyster cluster, dead shell, crab, piece of biota, etc. inside of a 0.25 x 0.25 meter quadrat. After washing away the mud, extracting the living organisms and preserving them in ethanol, and weighing, measuring, and recording each live and dead oyster, I have developed a solid database of the oyster reef communities at each of my sites. This will help to better describe the type and abundance of species present at each site. Oyster reef communities impact us in more ways than providing a tasty appetizer at a restaurant. Not only do they provide a habitat for commercially and ecologically important species, but they also serve to locally improve water quality and prevent erosion. Oyster reefs are complex communities that are in a state of decline along the Florida coast. Unfortunately, unhealthy oysters cause unhealthy or collapsed resident species communities because these organisms depend on oyster reef habitats for food, shelter, and other important aspects of their life cycle. This experiment and preliminary data set provides insight to changing food web dynamics occurring not only along the Matanzas River but in all oyster reef communities. 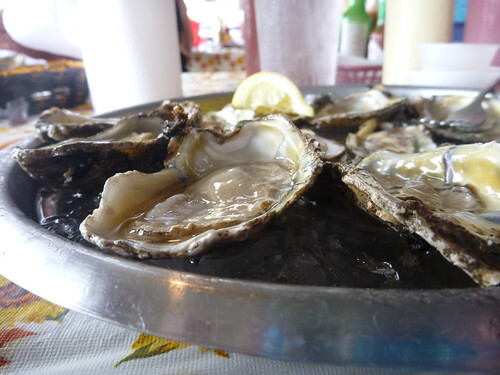 Tasty as they are, oysters have a far greater ecological- and economical- value when they're alive in their oyster reefs. Whether you are enjoying seafood for dinner or driving on a bridge over estuarine environments, keep in mind the important role each individual species plays in a larger community structure. Our actions upstream of these fragile habitats impact everything from microscopic worms to the maturing oyster spat and larger fish populations. As my project evolves, I hope to not only strengthen the scientific community but also raise awareness among people who unknowingly influence an aspect of oyster reef habitats.